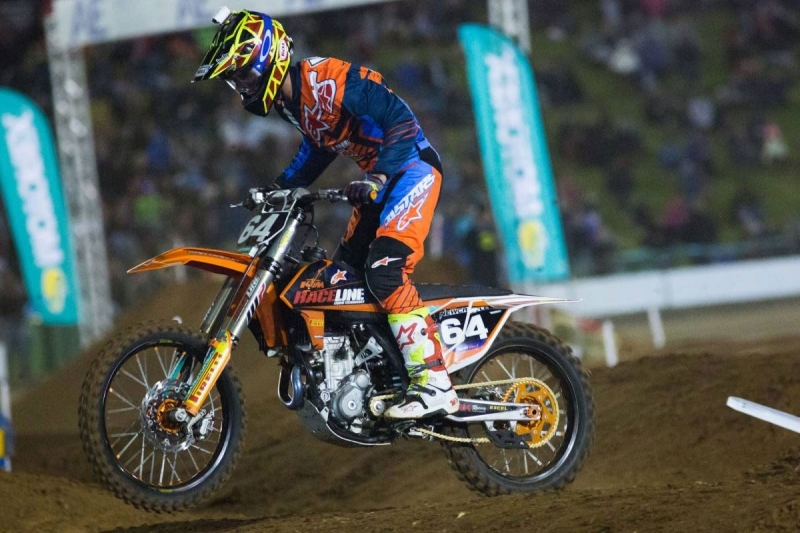 Raceline Pirelli KTM’s SX2 riders Dylan Wills and Jesse Madden have left one of the most technical rounds of Supercross that Australia has seen in years with impressive results, after an action packed Friday night at Round 2 of the Australian Supercross Championship at Toowoomba yesterday. With Wills having solid preparation leading in to the round, and Madden having just recently re-joined the team, both KTM 250SXF riders were feeling confident ahead of the second instalment of the series, and despite the track catching out some of the most talented riders in the country last night, both Wills and Madden raced to consistent results. For Wills, round two was a fresh opportunity to put the Jimboomba result behind him, and when his bike hit the track that’s exactly what he did. After qualifying in ninth position, Wills raced to an outstanding 3rd place in his heat race and then followed that result up with 7th in the 15 lap main, rewarding the team with a result just outside the SX2 top five. For Madden, Toowoomba marked the first opportunity for the young Queenslander to jump on board a KTM four-stroke this season. And despite only have just over a week on the bike, Madden qualified in 18th, took fifth in his heat race and wrapped up the night’s events with an 11th place finish in the main. “I’m feeling pretty good about this round – I’m not entirely happy with the full 15 lap main, but I’m pleased to get through this weekend injury free. The track itself was pretty crazy and we managed to get 7th overall,” Wills shared. “The result isn’t exactly where I want to be, and I know I can be better but it’s just a matter of time – we’re building every time we go racing. “I’m feeling good after this round. I got off to a pretty bad start but I was quite surprised with where I was sitting for most of the main event,” Madden shared. “I managed to make a few passes, and the goal was just to get through each lap nice and clean for the full 15 laps. “It’s been a pretty positive weekend for us. The track at Toowoomba really tested a lot of riders, and just putting in 15 clean, solid laps is an achievement so we’re very pleased with both of the boy’s results,” Woods shared. “Dylan took some great steps in the right direction this weekend. He finished third in his heat race, and was nice and consistent in the main event which was the goal for this round – especially with the track being so technical. “With Jesse, we didn’t put any pressure on him as we knew that he had only just recently jumped on the four stroke, but to finish 11th in the SX2 class at a track like that was fantastic. Raceline Pirelli KTM will now prepare for Round 3 of the 2016 Australian Supercross Championship being held in Adelaide in South Australia on Saturday October 29, 2016.